LINDSAY – Teacher’s change lives across the country every day. High school teachers change lives at a critical crossroads for students deciding what they want to do as adults. Continuation high school teachers change lives by helping students decide who they want to be – another failed statistic left in the past or someone with the skills to rise above circumstances for a better future. Not every school has a teacher with the dedication and opportunity to completely turn someone’s life around before their adult life has even begun, but John J. Cairns in Lindsay is lucky enough to have two. Last week, Erik Gonzales and Dennis Doane of John J. Cairns Continuation High School in Lindsay were nominated for the 2018-2019 national LifeChanger of the Year award, a national recognition program that honors K-12 public school educators and employees who are making a difference in the lives of students by exemplifying excellence, positive influence, and leadership. Gonzales, the school’s internship coordinator, was nominated by Doane, the school’s principal, for instilling hope and a positive outlook in all students. He has played a major role in shifting the culture on campus, resulting in John J. Cairns being honored as a Model Continuation High School this year, with a 96% attendance rate and 2% suspension rate. Gonzales is also responsible for designing and implementing an internship program that has produced life-changing experiences for all students. 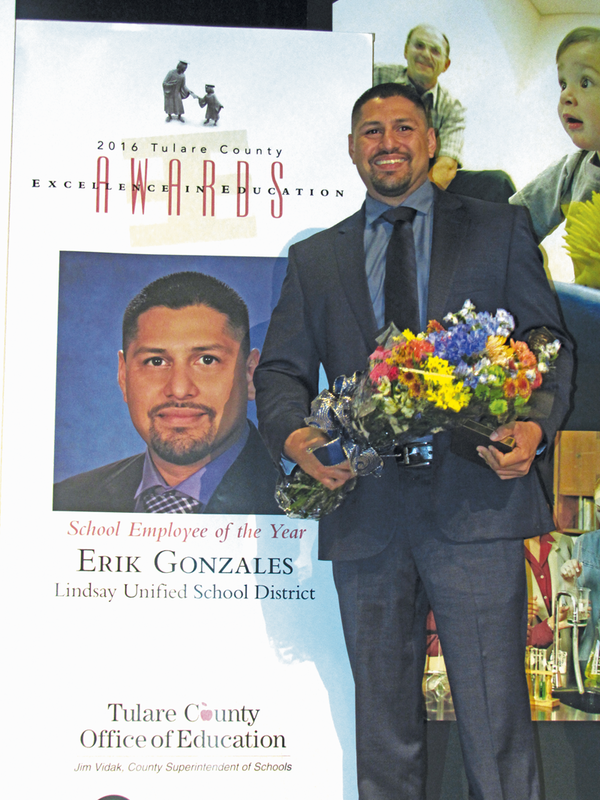 Doane was nominated by Gonzales for his leadership and dedication to his students and staff. He takes the time to know all students and their stories, which has deeply impacted his disciplinary methods. Doane’s first response to students with disciplinary issues is firm kindness. He understands that many of his students come from troubled homes or have issues outside of school that impact their attendance, academics, and behaviors. In a positive manner, he influences even the most troubled students and helps them interact with teachers and parents. Doane began at John J. Cairns as a Community Day teacher before being promoted to principal. Upon his promotion, he began to propel the school forward with his ability to form meaningful relationships with his staff and students. Upon his transition to principal of John J. Cairns, he focused on building academic excellence. Under his leadership, the school has obtained its WASC accreditation, all courses are A-G approved, and has been recommended for Model Continuation High School by the state of California. He has led this school to be on the cutting edge of education with its internship-based learning program. The internship program has boosted attendance, suspension rates are down, and student achievement has attracted the attention of Stanford University. Under Doane’s leadership, John J. Cairns has become the focus of a social-emotional learning study of students. This research will be published next year, and will highlight the work at John J. Cairns under his leadership. Doane also contributes to his school’s positive atmosphere through his conduct with his teachers. He is supportive of the needs of his staff. He consistently checks in with them, extends supports and solicits feedback. Mr. Doane has created a positive environment for teachers that translates into a positive environment for students. John J. Cairns possesses high morale, and the staff feels appreciated and heard. Each school year, LifeChanger of the Year receives hundreds of nominations from all 50 states and the District of Columbia. Seventeen individual LifeChanger of the Year awards will be given before the end of the 2018-2019 school year. Ten winners will receive $3,000, four finalists will receive $5,000 and the grand prize winner will receive $10,000. To view nominee profiles, visit www.LifeChangeroftheYear.com.